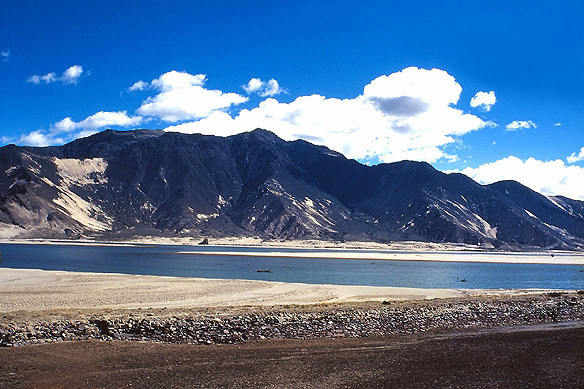 On the banks of the shimmering Yarlung Tsangpo (Brahmaputra) river, nestled in barren mountains draped with bleached sand dunes, lies Tsedang, the cradle of Tibetan civilization. According to Tibetan mythology, human beings were transformed from monkeys, and this was believed to have taken place in Tsedang. It was also in Tsedang that the earliest kings of Tibet, the Yarlung kings, ruled from. 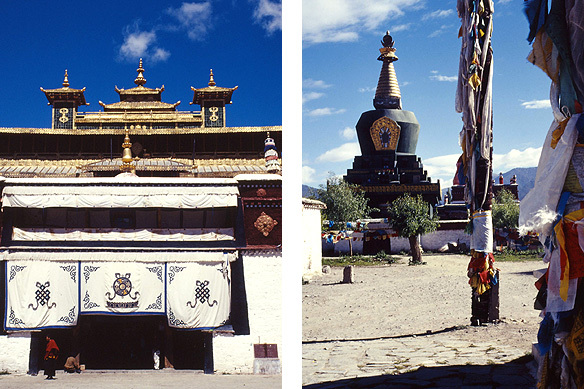 Both, Tibet’s very first monastery and palace were built here. Trison Detsen, the 38th Yarlung king, enshrined Buddhism as the state religion in the 8th Century, leading Tibet onto a spiritual path for centuries to come. Samye monastery, Tibet’s first monastery was built between 775 and 779 AD. Its founding symbolised the ultimate subjugation of primitive Bon belief by Buddhism. ‘Seven examed men’ were chosen by Trison from the royal families to be the initial monks in this monastery. Today around 400 monks live inside the ancient walls. The monastery is designed on the plan of the Odantapuri temple in Bihar, India. It mirrors the basic structure of the universe as described in Buddhist cosmology and is rich in history and legend. The building is laid out in three styles. The ground floor is the original structure and built on Tibetan lines with columns and bronze prayer wheels lining the ancient painted walls. The second and third floor, both renovated after the Cultural Revolution, are on Chinese and Indian tantric lines respectively. The story goes that when Trison had tried building the monastery at Samye, every effort was strangely thwarted. The labourers would work during the day to only have all their work crushed and destroyed by demons during the passage of night. The king eventually turned to the famed Indian master, Padmasambhava, for assistance. Padmasambhava was adept at tantra and succeeded in destroying the demons by showering stones on them. Said to have been born in a lotus flower, Padmasambhava went on to find Nyingmapa, the ancient red sect of Tibetan Buddhism. Another tale conveys the deeply engrained Buddhist belief that the Master is the supreme of all mortals, even kings. It recounts Trison and Padmasambhava’s first meeting in which the king refused to curtsy in front of the master. To illustrate his power Padmasambhava set the king’s sleeve aflame and Trison was forced to bow down. On the outskirts of the monastery is Hepori where Padmasambhava and his tutor Sandarashida used to meditate. Sandarashida died in these mountains and a stupa stands on a hilltop to honour him. Inside lie his clothes. Next to the stupa is a temple where both tutor and disciple once worshipped. 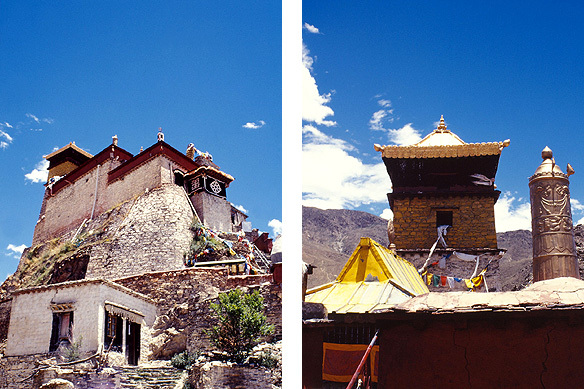 Tibet’s oldest building is the Yumbu Lakhang. The palace was built in the 2nd Century BC for Nyatri Tsenpo (shoulder throne), the first king of Tibet. Yumbu means sheep and Lakhang means a temple. A Tibetan legend narrates how the Tibetans once saw a young man walking and when they stopped him and asked him where from he came he pointed to the skies. The Tibetans took this to mean he had been sent from the heavens, raised him to their shoulders and declared him their king. When the monarchy ended, the palace was turned into a monastery. Perched on top of a steep outcrop of sheer rock, the edifice resembles a sheep’s leg. The walk up is a meandering little path, at places a nearly perpendicular stretch. Streams of pilgrims slowly make their way through, bent over with the extremity of the climb, their ruddy weathered faces creased in smiles. I chose to go up the easy way: astride a horse decorated with glittering bells and woollen ribbons. It was my best adventure to date. Never had I rode a horse before. Never had I rode a horse so close to the edge of a mountain cliff before. Miles of golden rock and sand stretched out below me while a cerulean blue sky with prayer flags smiled above. The palace comprises a few small low dark rooms lined with ancient texts, statues of past Yarlung kings and gods, yak lamps and red blanketed benches. The structure narrows as one climbs up ladders and steps, on to a small little enclosure that serves as the roof. Monks scuttle through this labyrinth, some carrying out centuries old rituals, some deep in study. As per legend, during the reign of Tho-Tho-ri Nyantsen, the 28th Yarlung king, Buddhist Sanskrit scriptures were dropped on the roof of the palace from the cosmos. The Tibetans have been devoutly studying these scriptures ever since. Most pilgrims wear traditional costume. Men typically are dressed in knee-length black or grey sark over trousers with sashes; some pilgrims from Kham province in Tibet’s eastern region carry long daggers at their waists. Women wear combinations of bright colours—reds, greens, blues, and magentas—with ribbons braided into their hair. Nearly all pilgrims carry a mala, or Buddhist rosary, a prayer wheel, and small, cup-like yak butter lamps, offering yak butter or money to the deities. My day finally came to a close with a visit to Amisang Cou, a nunnery in a Tibetan village where I met a nun called Nawangzomje. I sat in her little room resplendent with a television, innumerable images of deities, swarms of flies and was served endless cups of warm coke as we laughed and talked. There were 66 nuns at the nunnery, the youngest being 22, the oldest 77. Nawangzomje was in the middle of Nungnai, a fasting period of 15 days, during the first eight days of which she was not allowed to drink water, speak or even swallow her spit. On the eighth day, they are given a brief respite during which they are permitted to talk and have one meal consisting of yak butter. Today was the eighth day. She’d been in the nunnery for now 10 years, having come in at age 18 from a family of six. There is a touching simplicity in these villages. Towers in each corner of square whitewashed wood and brick houses hold up prayer flags. Yak heads guard doorways while calves graze in the yards. Small windows keep the cold winters away, embellished with frilled canopies and enclosed in black borders painted against the white walls. Poverty and smiles both vie for attention, both equally sincerely. This entry was posted in Exploring our World, Tibet and tagged Amisang Cou, Buddhism, Buddhist Monastery, Buddhist Nunnery, Nyingmapa, Padmasambhava, Samye Monastery, Seven Examed Men, Tantra, Tantric Buddhism, Tibet, Tibetan Buddhism, Trison Detsen, Tsedang, Yarlung Kings, Yumbu Lakhang by Rama Arya. Bookmark the permalink.